Fancy some adrenaline with your group ? Experience Box Spain brings you the next generation adventure combat games. Funnier than paintball, safer than paintball, more mobile than paintball, the laser combat is the future. Use brand new laser guns to fight against other teams and achieve specific goals. These next generation guns are perfect replicas of the real weapons (noise, weight, etc) and even inform you when you have "touched" a target. Laser combat is 100% secure and, as there is no paint balls involved, it does not hurt. You can play in your own garden, home, finca, hotel,offices, beach, etc. Generally, for groups up to 30 pax, we organize the incentive activity on the beach. Experience Box Spain will get the authorizations from the local Town Hall and organize your event to ensure a lot of fun. This can be combined with laser clay shooting, mini olympics and any other group activities on the beach. Optionally, we can have food and drink available on the beach for your team, or even combine this activity with others to create several workshops, like a segway team building, drum circles, etc. 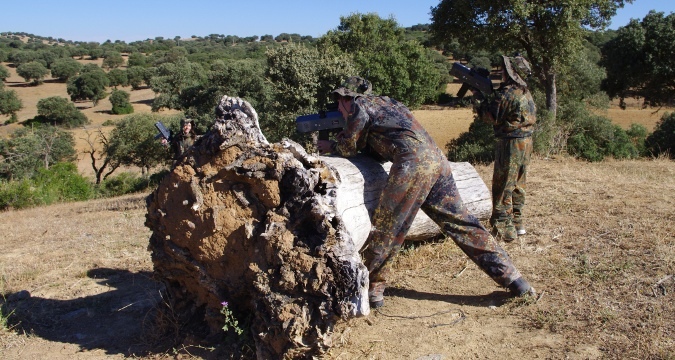 Laser combat is a great activity for groups of 10 to 32 persons looking for challenge and fun. We have a total of 16 guns.